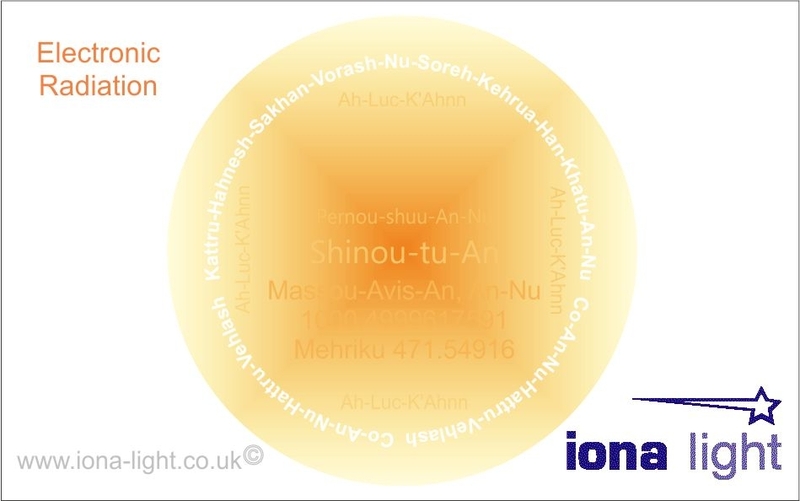 Iona Light’s unique range of spiritual products (tools, books, healing cards, essences and CDs) are channelled to help lightworkers and others progress more rapidly towards Ascension. For more information on the spiritual technology used and how it works, please see the page on spiritual technology. Results reported following use of our products are based on feedback from clients about their experiences. Since these products work on the subtle bodies, we cannot offer scientific proof relating to the information we have been given by clients and through channelling. We find that experiencing the products is the most effective way to decide whether they are suitable for you and how you can best use them. We encourage all clients to use their discernment about which products are most appropriate for them at any given point in their spiritual process. We are available on the telephone to consult on any product you have purchased. You will find information about ordering here or at the bottom of this page. This special healing tool, a CD issued in a DVD case with an accompanying information leaflet, offers a combination of inspiring words, Anaritas light language and gentle music to allow you to bring your physical body closer to a state of natural health. Embedded within the CD are the 3 Sacred Prayers - prayers of Light, Love and Peace - that run silently in the background as a foundation for real and lasting health changes (also available as a separate CD for active manifestation). They are an invocation that brings Source-light through the programmed intentions for natural health, making their effect very poweful. 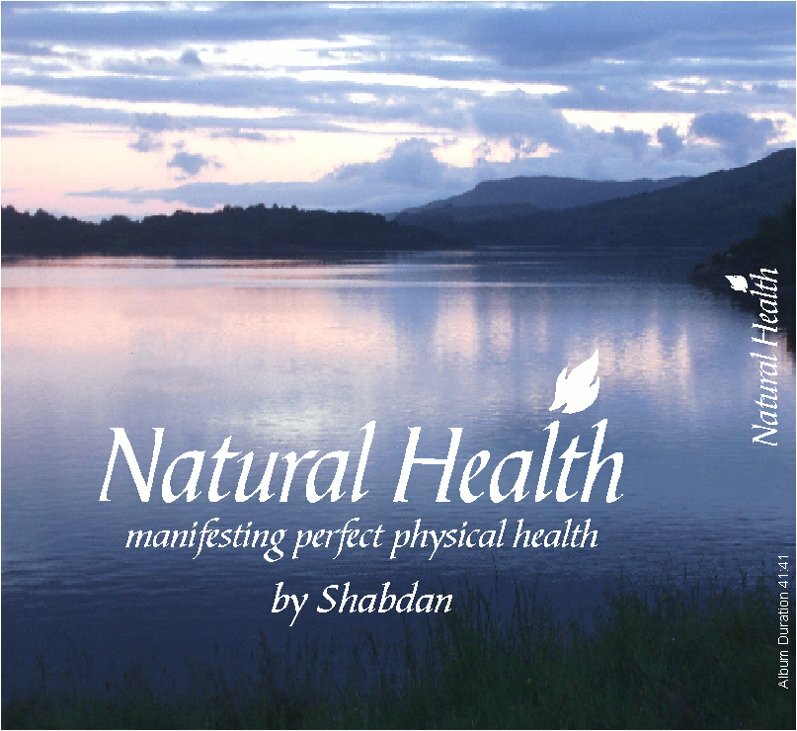 This is a completely original self-healing tool, created by Shabdan. It has never existed on Earth before, and has been described by his guides as a 'welcome and unexpected occurrence'. 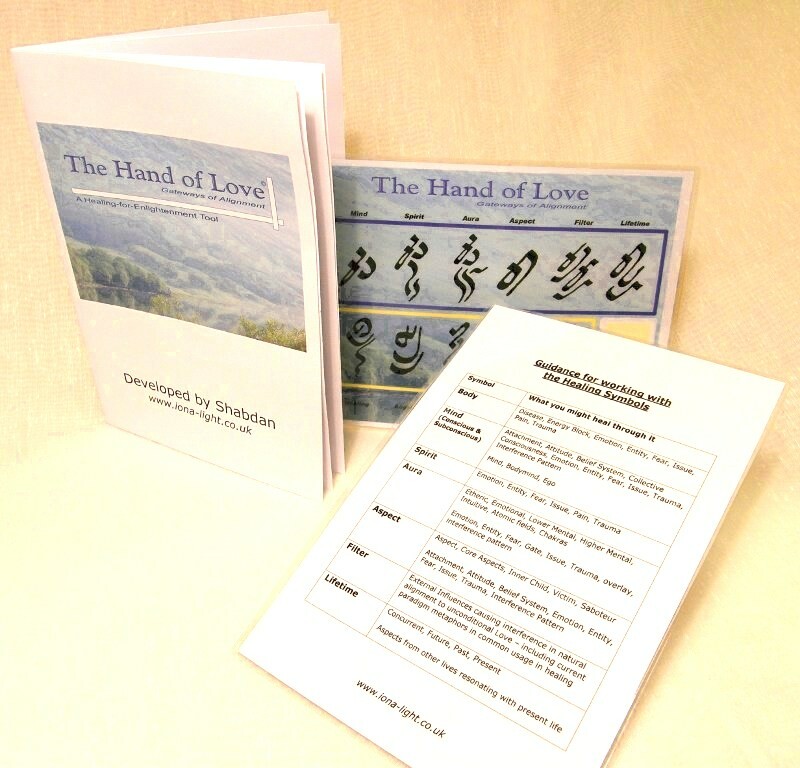 The Hand of Love is a small A5 laminated card printed with symbols that are part of Shabdan's keys. It comes in a box with an instruction booklet and a quickview summary card that makes it very easy to use. Inspired by the finger-touch consoles on 'Star Trek', you touch the 'keypad' to create a healing circuit. You then have access to powerful healing energies to clear whatever you have set your intention to heal. By touching the keys in sequence as dictated by your intuition and your heart, you not only release what you want to heal but also start to strengthen your psychic awareness as you feel where to go next and note which symbols still feel they hold energy to clear. Once you have completed the work, you touch each of the lower set of six symbols in turn to rebalance your aura, transform the energy and fill your being with light. 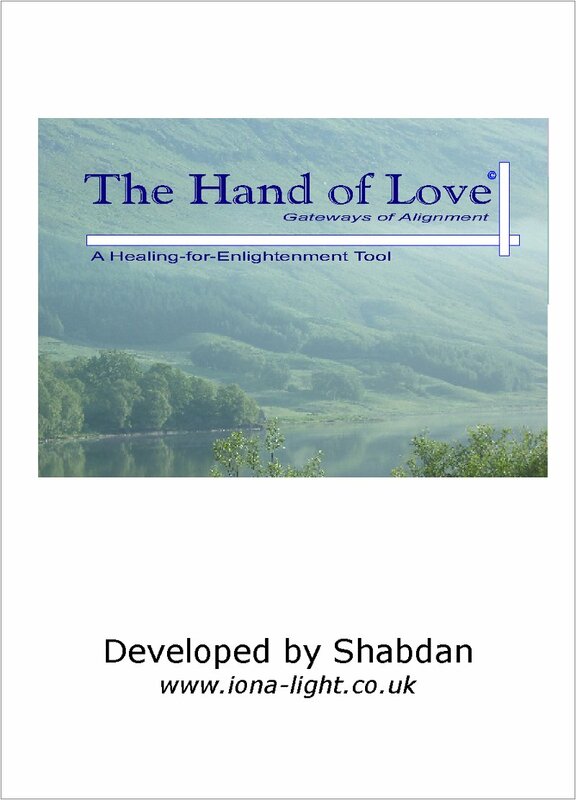 The Hand of Love is a wonderful tool, allowing you to address all areas of your energy field and to target external interference and heal aspects of yourself in this life and past/present/future lifetimes. £22.00 including UK P&P. Angel Radiance is healing tool direct from Archangel Metatron offering a comprehensive angelic healing package. It is a laminated light temple that you access with your fingers, moving through different levels of angelic energy until you reach Metatron's Light Chamber. Elements of the Seraphim energy oversee this process. It is very easy to use, and a lovely new way to connect and work with the angels - it can help take you into a beautiful angelic space for meditation. 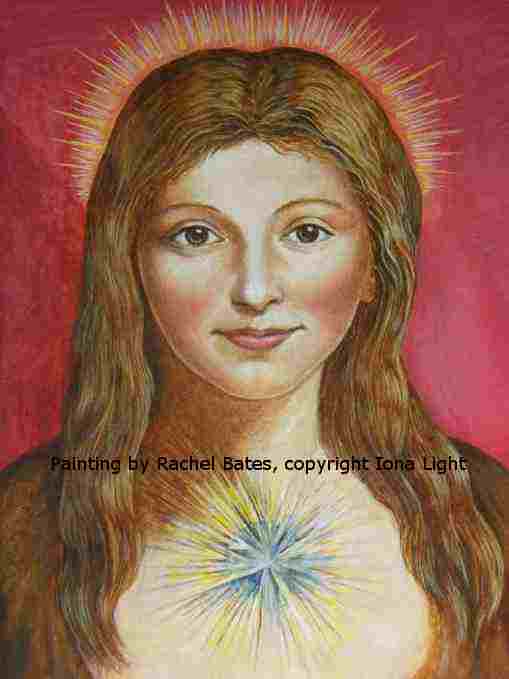 Once you are familiar with Angel Radiance you can move on to use the tool to connect with specific Archangels, chakras and angelic levels, and also use it for Earth healing. 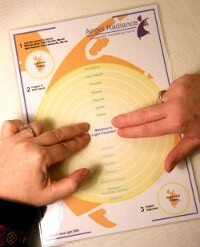 Angel Radiance comes with full instructions in an A4 pack and costs £19.00 including UK P&P. 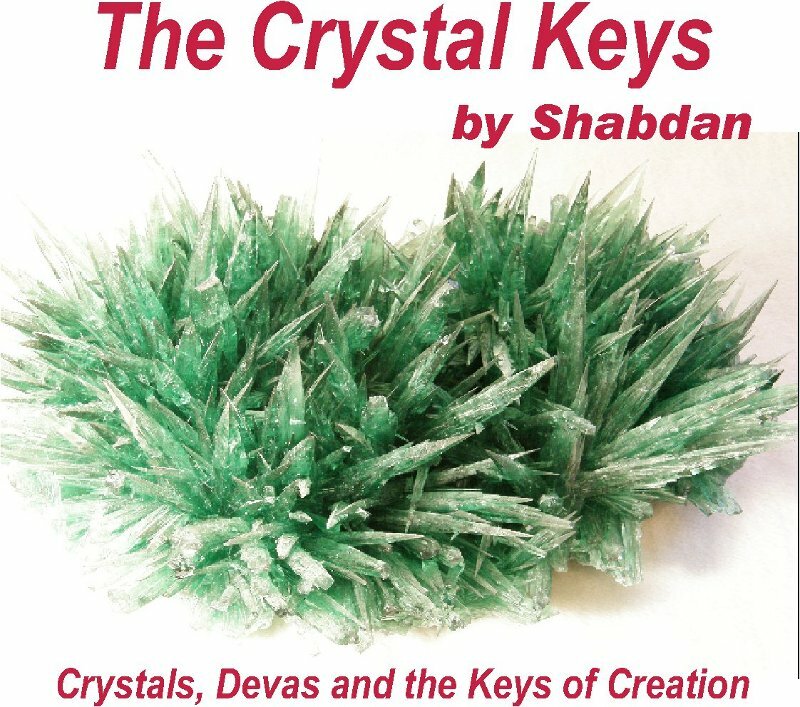 Shabdan's book The Crystal Keys - Crystals, Devas and the Keys of Creation is a healing tool in itself and contains new light language, keys and healing codes to help you cleanse, connect and work with your crystals and their devic guardians, as well as information on how to heal your own etheric blueprint and crystal matrices and to contribute significantly to Earth healing at the advanced levels now needed. The Crystal Keys is an important new medium for this new time. It will help you to connect more deeply with the energies of the Earth and the crystals in your care, as well as work in new ways for your own self-healing. Photograph illustrations by Shastra. Available by mail order at £11.50 including P&P. Please order direct from us. Ascension Reiki is healing energy for the modern age. It is gentle, pure and powerful ascension energy presented in a self-attunement system open to all and designed to be used by anyone with an interest in healing. Nineteen ascension symbols form the basis of this energy system, creating links to the new frequencies coming in to the Earth now as well as the plant and mineral kingdoms and the angelic realms. Ascension Reiki was developed in 1999 and hundreds of people have attuned and found it an important tool in their spiritual development. 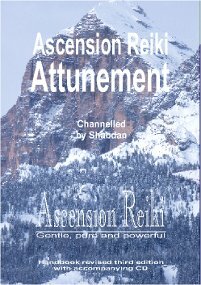 The Ascension Reiki Attunement Handbook was formally published on the 10th anniversary of Ascension Reiki in 2009. 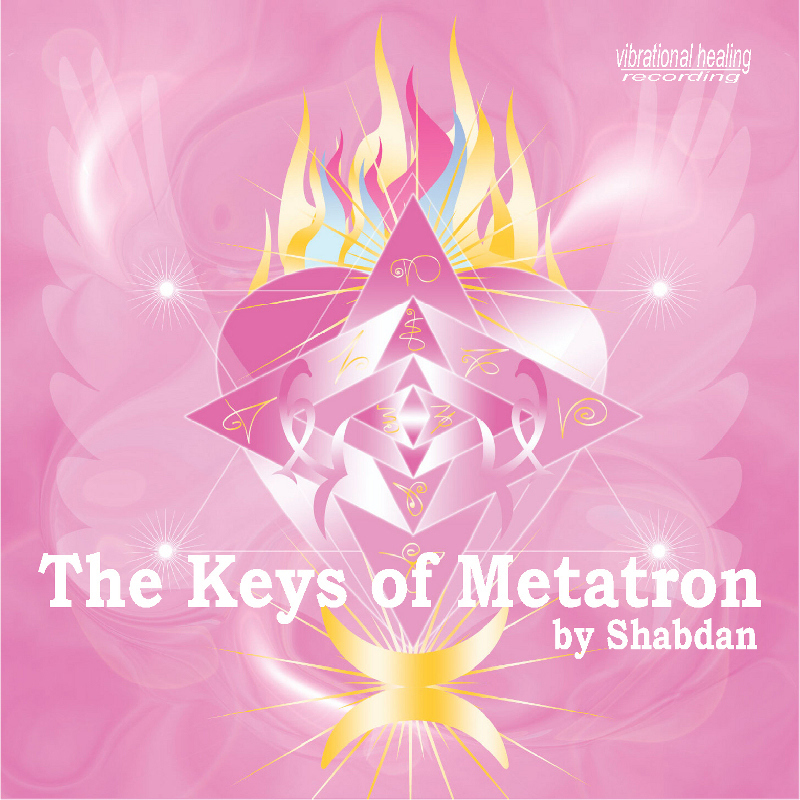 It contains key information about this high-level healing energy system (and all the tools required for self-attunement to Ascension Reiki energies) and is available from Iona Light together with a free guidance CD in which Shabdan talks you through the attunement. 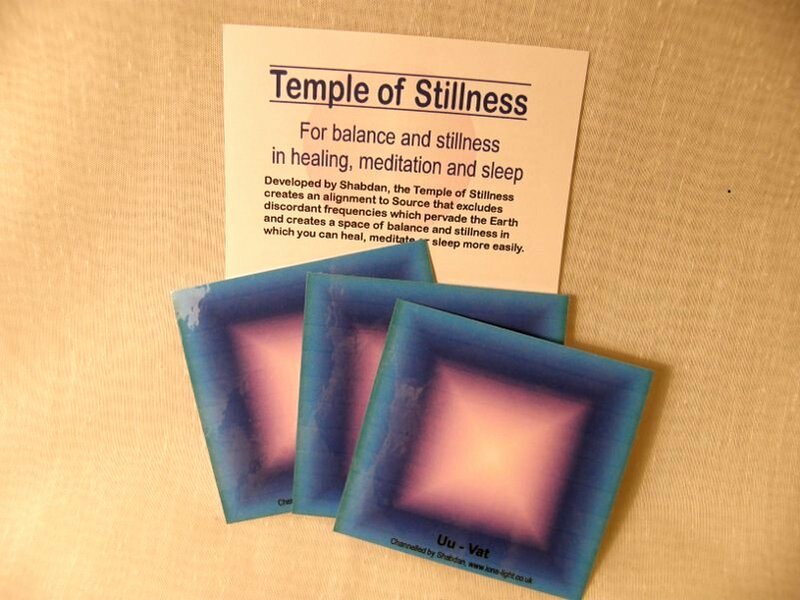 Ascension Reiki costs £42 including postage and packing. Click on this link to find out more about Ascension Reiki. Balance electronic radiation in your Space: this is a mini-tool (pocket/credit-card size) designed to help protect against the impact to your energy field of electrical, electronic and full spectrum radiation as well as negative magnetic, light (for example from low energy bulbs containing mercury) and sound energy, transforming these frequencies into positive life-supporting vibration. The effects of this tool are not scientifically proven, but it has been tested by a Kinesiologist with excellent results. If you are not happy with your purchase, you can return it for a refund within 16 days of receipt. The matrix in Electronic Radiation links with the Cathedral of Surumetra and the Devic Light Codes to produce its positive energy effects. It operates in a sphere radiating out 10 metres from the card in every direction. Cost: £8 each plus £1 postage (postage valid for up to 12 pocket cards). Sanctuary is designed to support lightworkers as the going gets tough. These are challenging times for many, and we have developed this tool to help create a sanctuary space in which you can clear energies that are blocking or disturbing you. Sanctuary is a complex matrix energy tool that works to transform negative vibrations in body.mind, spirit and aura, bringing illumination to help you understand and release what is holding you back. It also aligns you to the cosmic lattice of Creation to centre and balance you. The element of alignment to Divine Will and Divine Light allows discordance to clear safely and brings you more closely into divine relationship with the unity consciousness that underlies all life. Sanctuary cannot interfere with free will, but it will help the user move to a place of reconciliation where discordance can be released more easily. It operates most fully when you place your full attention on it, and so can also be a tool to increase presence. Use it for meditation and clearing, to create a positive energy space in your home, car or workplace, and to help you keep your healing room clear while working with clients. Sanctuary is available as an A5 reversible laminated poster with a design on one side and a photograph on the other - you can change the picture around from time to time to help you continue to notice and work with it in the course of everyday life - and as a pocket-sized card (design image only) that you can carry around in your purse or wallet. It comes with an information sheet. Cost £10 each for A5 size plus £1 postage (£1 postage is valid for up to 4 A5 images) and £8 each for pocket size (equally powerful, but same design both sides) plus £1 postage (postage valid for up to 12 pocket images). This Temple, which can be used alone or in conjunction with the Temple of Stillness, creates a sanctuary space when the symbols are arranged in a triangle on the floor or affixed to a wall. It sets aside your unhealed issues so that you can teach, offer and receive healing, and radiate your light, without also passing on your issues. The symbols radiate unconditional love throughout your body, mind, spirit and energy field and hold you in divine connection with Source. Your positive intention is very important when working through them. The temple comes in kit form with a small plastic pocket included so that you can carry your temple space around with you wherever you go. The space it creates feels very special. £6 per pack plus £1 postage. Participants in workshops who felt the benefit of Shabdan's keys cleansing food at mealtimes asked for this to be made available to use at home. Designed as an attractive laminated placemat, this matrix raises the vibration of food (including wheat, dairy and sugar), cleanses the vibration of water, amplifies light frequencies, balances yin/yang and aligns food towards Source. This can help everyone to be lighter in vibration ("you are what you eat") and can particularly support lightworkers who find the vibration of some foods difficult to process. The matrix can also aid digestion, both by clarifying what we eat and through use as an energy healing tool for the digestive system. 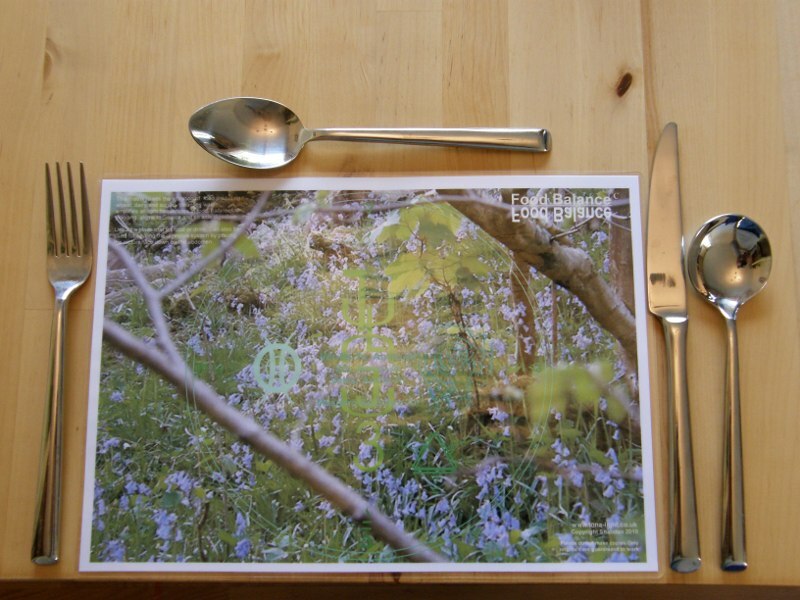 Use as a place mat for food or drink. Can also be used for energetic healing of the digestive system by placing the picture face down on the abdomen. Size: A4. 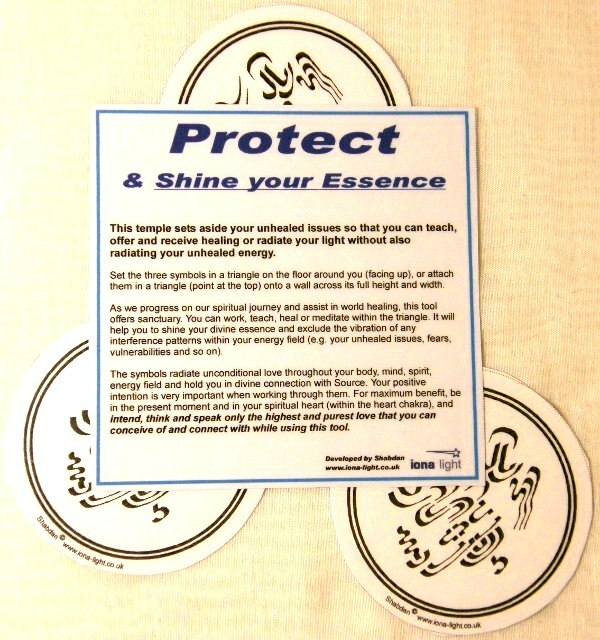 Cost: £8 each (+£1.75 postage for each order of up to 8 A4 mats). Special offers: 4 for £32 including P&P, 6 for £48 including P&P. 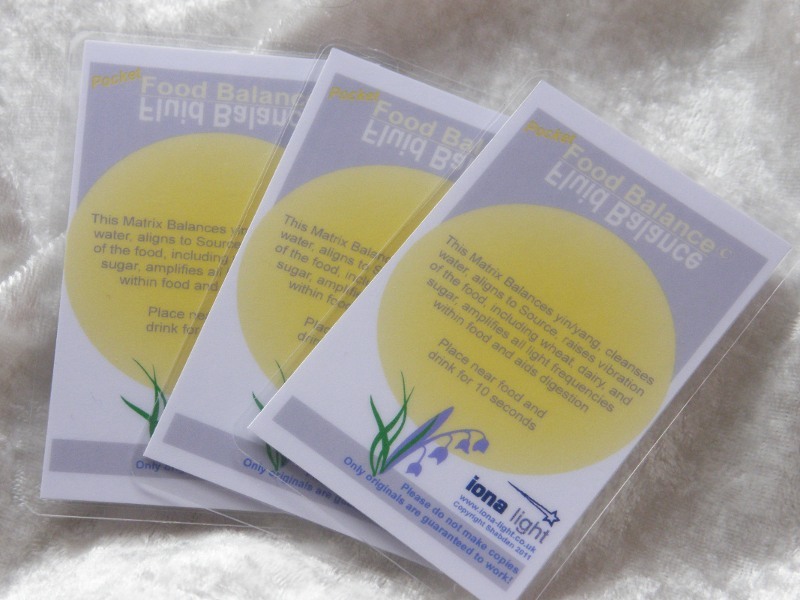 Pocket size Food Balance 'Food Balance' to carry in your purse or wallet. Place next to food or water to invoke all the qualities of the Food Balance matrix. Cost: £5 each plus £1 postage (postage valid for up to 12 cards). The cards use keys or symbols channelled from the nature kingdoms to connect directly to the vibration of the plant and mineral realms, allowing oils, remedies and crystals to be revitalised with energy from ‘home’. 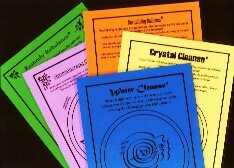 The fourth and fifth cards in the series work with water – Water Cleanse clears water of the patterning it picks up from anything it has come in contact with, and Revitalising Radiance can be used to programme water with your own heart energy to provide a perfect ‘revitalising remedy’ for you. Click here for further details. £6 each for A4 size (any card except Revitalising Radiance, which only comes in A5) and £5 each for A5 size (any card except Money Cleanse, which comes in A4 and pocket size), P&P costs £1.75 for up to 3 A4 cards and £1 for up to 4 A5 cards. 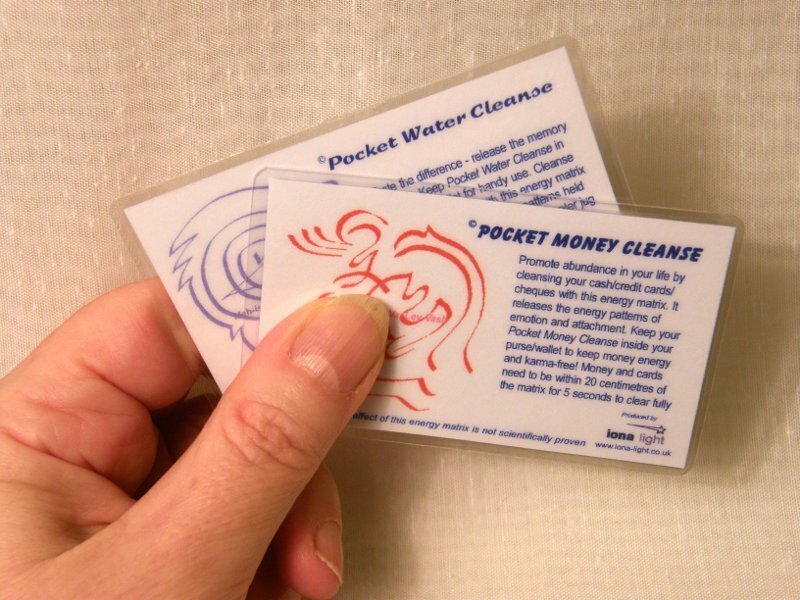 By popular demand, Money Cleanse and Water Cleanse are now available in wallet-sized versions so you can use them on the move. Adapted to work within a 20cm radius of the card, you can keep Pocket Money Cleanse in your purse or wallet to cleanse money and promote abundance, and carry Water Cleanse with you to use wherever you are. £4 each + £1 postage (postage valid for up to 12 pocket cards). Helps to cleanse the energy of electronic communications coming in through your computer (place it on the base unit) or paper communication coming through the post (place the post on it - we keep it on the mat so the post falls near it, and as long as it's within 30cm the symbol will start working). The symbol is on an A4 laminated card and is available for £6 + £1 P&P (£1.75 postage is valid for up to 3 cards). A smaller-size (same) symbol is available for modern slim towers - it also comes in A4 but you can cut the symbol out and it will then attach without protruding - just specify 'computer' when you order. Mary Magdalene's image was commissioned through us, directed by Mary Magdalene and painted by the UK artist Rachel Bates. Mary Magdalene is a beautiful Master of the divine feminine. She works on the magnificent divine feminine magenta ray. This image is currently available as a laminated 5 x 7 inch photograph, cost £6 plus £1 postage (£1 postage valid for up to 4 images). The website picture is only intended to give you an impression of the high-quality version you will receive. Created by Shastra, there are now four in the range of these high vibration crystal sound essences. They incorporate channelled sacred sound energy from the Seraphim, crystal vibrations and gentle aroma. Click here to go to our essence page (opens new window). Iona Light has a range of healing CDs including healing tools, healing music, background music for healing sessions and meditation, specific guided meditations and the spectacular Keys of Metatron CD. If you would like to place an order, please text Shastra on 07815 911 032 or call on 01382 581951 or email info@iona-light.co.uk to check stock. You can ask any questions about the products that interest you and we can advise you on any more recent developments. If you are ordering several items we will not charge multiple P&P - the figure will depend on the overall weight and size of the package. UK orders can be paid via bank transfer or by sending a cheque or crossed postal order made out to one of the partners to the address we provide. We will give you all the information you need when you confirm your order. Overseas orders can be paid via PayPal - we will send a PayPal invoice once you have confirmed your order. Postage rates given on the website are for the UK, and we will need to weigh your order to give you the final price for products sent overseas.